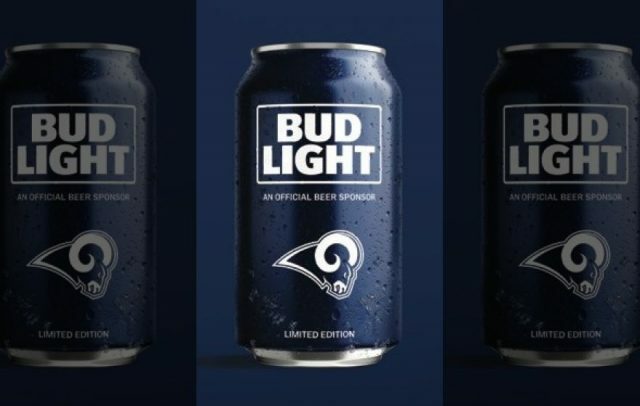 The NFL’s LA Rams will get their team logo on Bud Light’s ‘Fan Cans’ after all it has been announced. The team recently resigned a partnership agreement with the brewing giant making Bud Light the ‘official’ domestic beer of the franchise along with 27 other clubs in the NFL. An earlier deal with Corona, as reported by the drinks business, made that beer the Ram’s official ‘imported’ beer. Terms of the deal were not revealed but it will last three years before renegotiation and no doubt affords Bud Light prominent advertising and distribution rights at Rams home games. The franchise moved to LA from Cleveland in 1945 and remained in the city until 1994 when it was moved to St Louis, Missouri – home to Bud Light owner AB InBev’s main US operations. However, this year the team was moved back to LA to the delight of fans. In a nod to the team’s classic 1960s uniform, the Bud Light can features the team logo in blue and white, which are the colours the Rams will play in this year not the blue and gold they normally sport. AB InBev’s vice-president of marketing, Jorn Socquet, admitted that the brewer was sad to see the team leave St Louis but insisted it was keen to maintain the relationship it had built with the Rams for over two decades and that it provided an opportunity to build on its LA market. “For us it was very important to have the LA market,” Socquet told Fox News. Where can I find the Bud Light beer with the Rams Team Logo? I live in Fontana CA.